We meet each other next to the Rest House in Rum village between 9.30 and 10 AM. Here we enjoy a Bedouin tea. We take time to relax and talk about the trekking program. We start by walking to Rakhabat canyon. This canyon offers a 3-kilometre hike with an abundance of shade. You can learn about the ecosystem inside this desert canyon. We leave the canyon and walk to the red sand dune. You can climb the dune and enjoy running down. We walk to a quiet and shady place close to the red sand dune. Here we take a few hours break. We prepare a Bedouin lunch for you. After we finish our lunch there is time to take a rest or walk around to explore the area on your own. We start the afternoon with a short walk to the big rock wall called Anfishiyyeh. This rock wall is famous for its ancient inscriptions. After we admired the inscriptions we continue our trekking and walk to Little bridge. You can climb this bridge and enjoy the wide valley view. We stay overnight in a cave near Little bridge. We cook you a traditional Bedouin dinner. The evening can be spent around the fire. We can tell you about Bedouin culture and music or you can gaze into the starry night sky and enjoy the peaceful silence of the desert. You can wake up to the rising sun. We prepare you breakfast. After breakfast, we break up. In the morning, we walk through beautiful valleys all the way to the north side of Jabal Burdah. At a quiet and shady place at the north side of Jabal Burdah, we take a few hours break. We prepare a Bedouin lunch for you. After we finish our lunch there is time to take a rest or walk around to explore the area on your own. In the afternoon we climb up to Burdah rock bridge via one of the Bedouin roads. The climb is not so difficult. In a number of places, you might want to use your hands. And close to the bridge are the most difficult areas. For safety reasons, we use ropes here. At the top, you have a fantastic view over Wadi Rum desert. After taking the time to enjoy the views we head back. We stay overnight in a cave near Burdah rock bridge. We cook you a traditional Bedouin dinner. The evening can be spent around the fire. We can tell you more about Bedouin culture and music or you can gaze into the starry night sky and enjoy the peaceful silence of the desert. You can wake up to the rising sun or wake up before to see the sunrise. We prepare you breakfast. After breakfast, we break up. This morning we walk to Um Fruth rock bridge. 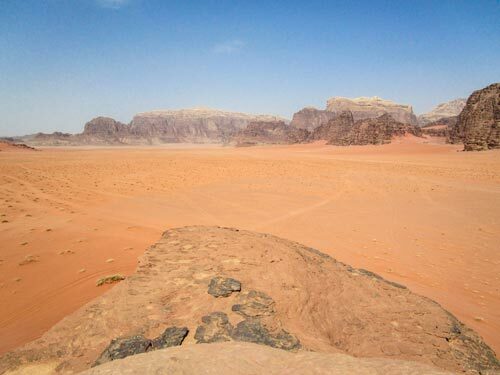 You can climb the bridge and enjoy the views of this part of Wadi Rum desert. At a quiet and shady place near Um Fruth rock bridge, we take a few hours break. We prepare a Bedouin lunch for you. After we finish our lunch there is time to take a rest or walk around to explore the area on your own. In the afternoon we continue our trek and walk to Um Mugur. We walk the area to enjoy the beautiful Um Mugur landscape. And around sunset time we arrive at an excellent place to enjoy the sun setting over Wadi Rum desert. We stay overnight in a cave close by the sunset place. We cook you a traditional Bedouin dinner. The evening can be spent around the fire. We can tell you more about Bedouin culture and music or you can gaze into the starry night sky and enjoy the peaceful silence of the desert. Wake up to the rising sun while we prepare you breakfast. After breakfast, we break up. This morning we do another beautiful walk. Our destination for today is Um Sabatah. On the way there we visit one of the Bedouin dams. At a quiet and shady place, we take a few hours break. We prepare a Bedouin lunch for you. After we finish our lunch there is time to take a rest or walk around to explore the area on your own. In the afternoon we continue our walk in the red desert of Um Sabatah area. Around sunset time we arrive at another excellent place to enjoy the sun setting over Wadi Rum desert.